If you are new to ASP.NET MVC you might not know about ELMAH and MiniProfiler. These are two distinct OSS projects that you can easily install with NuGet, and both provide valuable debugging and diagnostic services. Scott Hanselman has blogged about both projects in the past (see NuGet Package of the Week #7, and #9), but this post will highlight some of the updates since Scott's post and still provide a general overview of the features for each project. 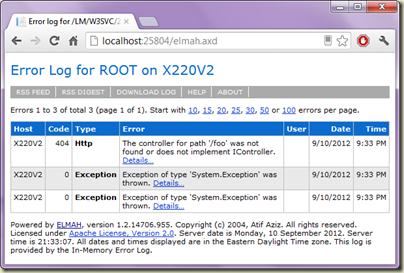 ELMAH gives you "application-wide error logging that is completely pluggable". In other words, you can easily log and view all the errors your application experiences without making any changes to your code. All you need to get started is to "install-package elmah" from the Package Manager Console in Visual Studio and ELMAH will be fully configured and available. Navigate to /elmah.axd in your application, and you'll see all the errors (this will only work for local requests, by default). ELMAH will keep all the errors in memory, so an application restart will clear the log. If you want the error information to stick around longer, you can configure ELMAH to store information in a more permanent location, like inside of a database. The elmah.sqlservercompact package will add all the configuration you need to store the error log in a SQL Compact database file inside the App_Data directory of the app. There are also packages to log errors to SQL Server (elmah.sqlserver), Mongo (elmah.mongodb) and more. Most of these packages require you to go into the web.config file to configure simple connection string settings, and possibly setup a schema (see the files dropped into App_Readme for more details). For ASP.NET MVC projects you might want to start by installing the elmah.mvc package. 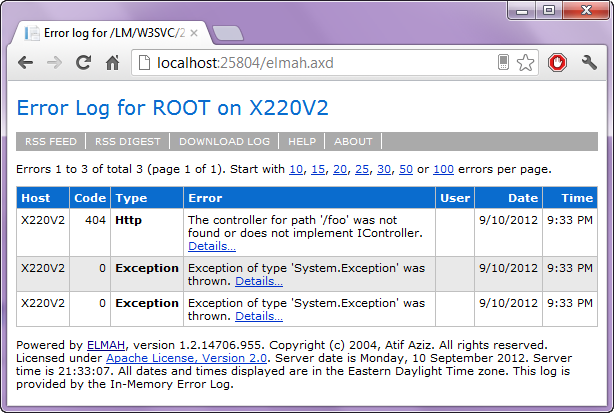 The elmah.mvc package will install an ElmahController so you can view the error log by visiting the /elmah URL. More importantly, elmah.mvc will install an action filter to log errors even when the MVC HandleErrorAttribute (the one that most applications use as a global action filter) marks an exception as "handled". The HandleErrorAttribute marks exceptions as handled and renders a friendly error view when custom errors are enabled in web.config, which will usually be true when an app runs in production. These handled exceptions are invisible to ELMAH, but not when elmah.mvc is in place. MiniProfiler can tell you how long it takes for actions to execute and views to render, and provides an API if you need to instrument specific pieces of code. The MiniProfiler install will also add a MiniProfiler.cs file in your App_Start directory. This file is where most of the MiniProfiler configuration takes place. From here you can enable authorization and database profiling. Two great projects to check out, if you haven't seen them before. Is the runAllManagedModulesForAllRequests part specific for MVC? I'm using MiniProfiler with ASP.NET WebForms (.NET 4.5) without the runAllManagedModulesForAllRequests option and it is working fine. According to the MiniProfiler site, you don't have to have runAllManagedModulesForAllRequests turned on, instead you can add a handler to the system.webServer section of the config. 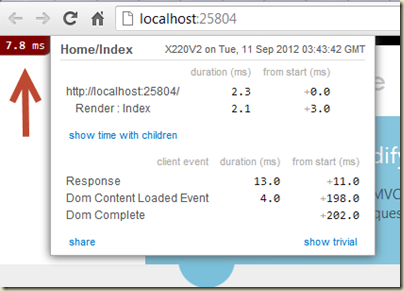 See the troubleshooting section at the bottom (http://miniprofiler.com/). May I ask next one to be on Glimpse. teams of publicity not to mention personalised clothes. in September two trading days,cheap polo shirts, the market is hot, no energy, no interest, no characteristic is obvious,Ralph Lauren Outlet, the heavyweights although after a boost, but still difficult to continue, but underestimate the value of financial sector strong trend, the market still exists to change the style characteristics.